Magpies Gourmet Pizza is a leading producer of a variety of pizza in the area of Arizona. The Magpies Gourmet Pizza was founded and incorporated in Tucson, Arizona. The products offered by Magpies Gourmet Pizza include starters, salads, toasted subs, calzones, specialty pizzas, and desserts. The pizzas are of different types namely the godfather, pesto, white pie, the beast, chicken picante, veggie, barbeque chicken, chicken primavera, the greek, chicken ranchero, magnificent giants, seven cheese, Juan carlos pesto, the magpie, Hawaiian, and so on. The size of the pizzas includes mini, medium, large, ex large, jumbo, and gluten free. There are currently 0 consumer reviews about Magpies Gourmet Pizza available. Share your review. Please take a note that you are about to post a public review about Magpies Gourmet Pizza corporate office on CorporateOffice.com. This review will be public, so please do not post any of your personal information on this website. 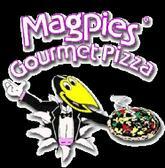 If you would like to contact the corporate offices of Magpies Gourmet Pizza, please use their contact information such as their phone number, website, and address listed above to contact them. However, sometimes staff from Magpies Gourmet Pizza headquarters do read the reviews on this website.